WordPress is constantly evolving, and Canvas is no longer a good option for site builders using newer versions of WordPress – we don’t want to recommend a theme we don’t think will serve you in the future. We’ll continue to provide support for active subscriptions, and for a year from today for lifetime subscriptions. We’ve created a comprehensive plan for all our Canvas customers going forward. We aren’t simply dropping the theme, we are going to walk this road with you. We know that this is a big change for you, but we believe it will set your sites up for better success in the future. Read on for more details about how we got here and how we can help moving forward. There are a few tweets going around about an exploit in our WooFramework. It happens to be making news around the same time we were hacked so naturally it could cause some hysteria about a possible link between the two and a vulnerability on our user’s sites. Rest assured there is no link and the exploit was actually fixed a few days before our website was hacked. 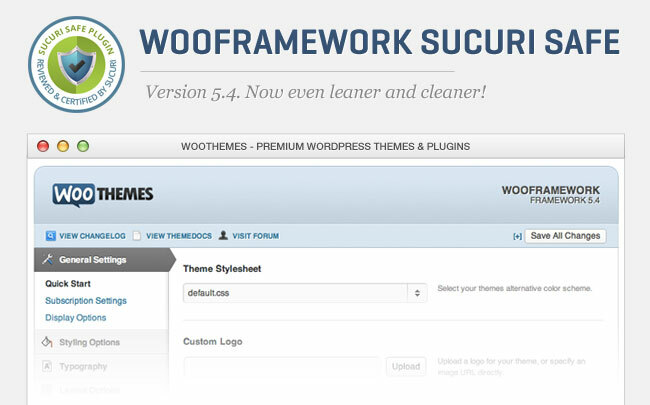 We have however issued another update to the WooThemes framework (V5.3.11 V5.3.12) to tighten the security of our themes even further. We recommend all users update their themes to the latest version, it’s really easy. Click the “Update Framework” button in our theme framework in the WP backend to grab and install the latest version. Here at Woo, we have a few components that make up each theme we release. The two main components are the theme’s design and code and the WooFramework. Our themes and the WooFramework alike, are updated regularly with improvements and bugfixes to enhance our products and keep them up to date with current trends and developments, as well as code improvements and refinements. Each theme, as well as the WooFramework itself, carries a version number, which is increased with each update or bugfix. As the WooFramework is so seamlessly integrated into all of our themes, it can be confusing at first as to which pieces are what, which files to upload when upgrading your theme and how the WooFramework fits into the bigger picture. While we have support documentation that explains theme upgrades, the rest of the pieces may require a bit more explanation. Today, I’ll be explaining what the version numbers mean, how to keep your theme up to date and what role the WooFramework plays in our themes. We’reÂ ecstaticÂ to launch the latest addition to the WooFramework – Sidebar Manager. The Sidebar Manager comes from years of my own personal experience with WordPress themes, having been frustrated with the rigid sidebars and widgetized regions. Blog sidebars quickly become static, boring and life-less when every page renders the same widgets time after time on every page – not giving your users a very dynamic or targeted experience. The Sidebar Manager gives you the power to create a unique sidebar for specific pages of your site. You can now tailor make each page with specific content and functionality across almost every aspect of the template.